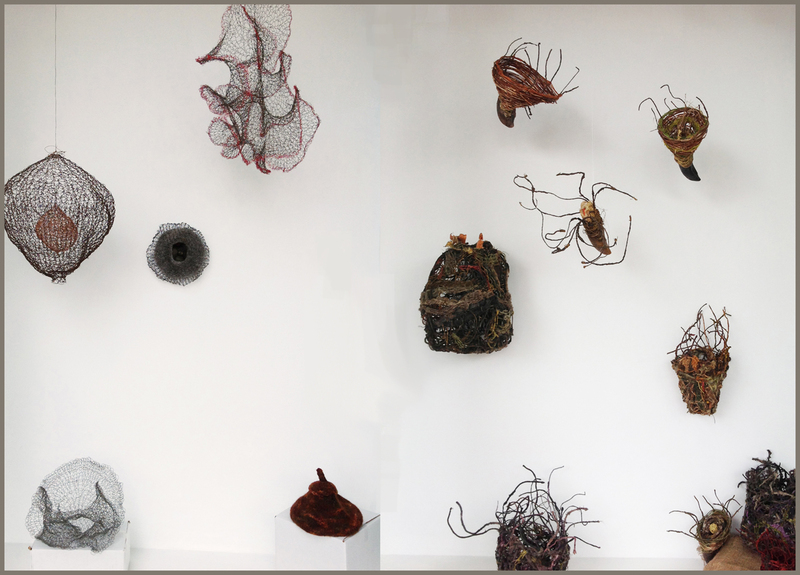 The Somerville Arts Council and the Inside-OUT Gallery in collaboration with Tori Costa, outreach coordinator for the NAVE gallery proudly present the works of Amy Pett & Ellen Solari--two fiber artists with different perspectives on the medium. Despite the contrast in their execution, both artists display a unique organic approach to their work. It is a compelling juxtaposition of manmade and natural elements for all to enjoy. I have always made stuff with my hands. I’m interested in representations of organic forms, especially female forms, including containers or vessels. Many of the things I create are about fecundity, female sexuality, and home. The pieces in this window are all hand knitted, a repetitive process I find meditative and soothing, and pleasingly productive. After knitting for decades with regular wool and cotton yarn, I began working with wire, which is a fascinating adventure--learning what wire’s nature is, what it likes to do, and what it resists doing. In addition, recently began exploring felting, and the felted pieces here are knitted and then wet-felted. Some wool is eager to make the transformation from fiber to felt, while other wool resists and takes a long time to convince. However long it takes, I’m always dazzled by the transformation. My knitted wire sculpture has been shown in Threads Bared at the Nave Gallery and The Knit Art House in Crochetville at the Nave Annex. I’m delighted to be back in Somerville. Ellen Solari is maker of sculptural baskets. Working with her hands is central to my artistic expression. The tactile experience of manipulating materials is what makes creating so compelling to her. Formerly a painter, she discovered the world of textiles after learning how to knit. A Boston native, she graduated with a B.F.A. from Massachusetts College of Art. "Dialogues", Kingston Gallery, Boston. . Since 2004 the Nave Gallery in Teele Square has been the public face of ARTSomerville, a nonprofit, loosely knit volunteer group of artists and arts enthusiasts with the mutual goal to create new space(s) to present art in Somerville. The Nave Gallery and the Nave Annex provide space for the collaboration and presentation of art of all media. Work of a collaborative, non-commercial nature is especially encouraged. In addition, they have created a number of public music, dance and art events including Project MUM (a dance party under McGrath Highway), 2012's Yarnstorm Perry Park (part of our ongoing Wrap Around Project), and SqueezeBox Slam, an outdoor festival dedicated to accordion and concertina music.